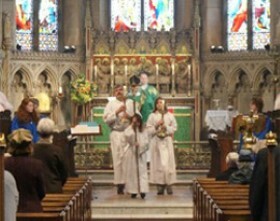 Our Worship follows traditional Anglican patterns and is centred on the Mass, the foremost Christian act of worship. Services follow the schedule shown below and any changes to this will be advertised in the Parish Diary. 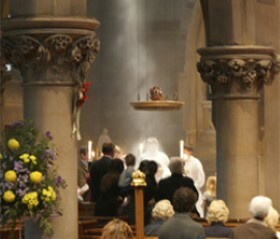 We are also able to offer Baptisms, Weddings and Funerals. Please contact us for more information on any of these services. We operate a Sunday School, which is held at 10.30am at the Church Hall, St. Augustine's House, 9 Lyttelton Road and welcome children between the ages of 4 and 12. 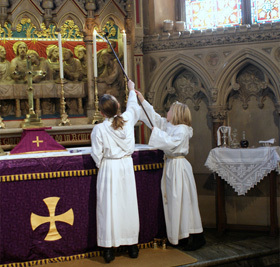 Young acolytes can be seen below lighting altar candles on the fourth Sunday of the month when Sunday School is held in church. 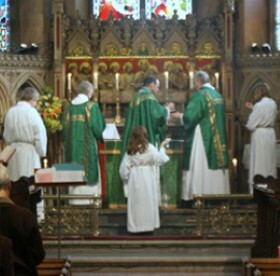 The children take an active role in worship. The children are encouraged to participate in worship, providing plays at all major festivals. For younger children, there is also a Play Area with toys and books in the Narthex.